As the needle dug into my flesh, I recalled how much a tattoo can hurt. I also remembered that it wasn’t nearly as painful as I first anticipated. And in the end, for a design I truly loved, it was all worth it. 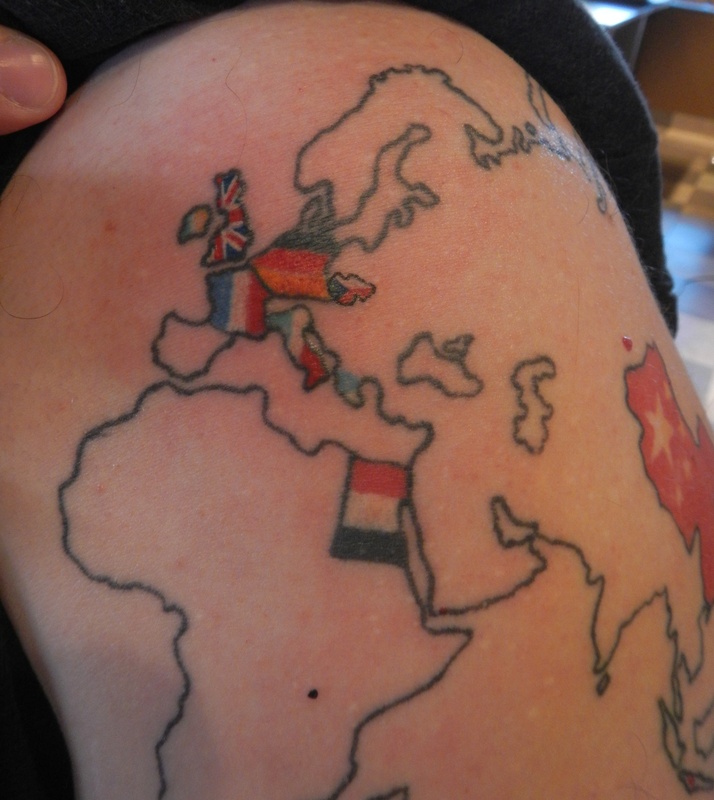 I wasn’t at Denver’s Th’ink tank Tattoo, though, for a new tattoo, but instead to update an old one – my travel tattoo. I was first inked three years ago in Las Vegas. Over the years I’ve visited a few new countries, albeit not nearly as many as I would have hoped, and felt it was time to get some places filled in. I thought of doing it on my return trip to Las Vegas this past fall, but the prices at each of the shops I checked out were just too expensive; the novelty of getting a tattoo in Las Vegas drives the cost up. 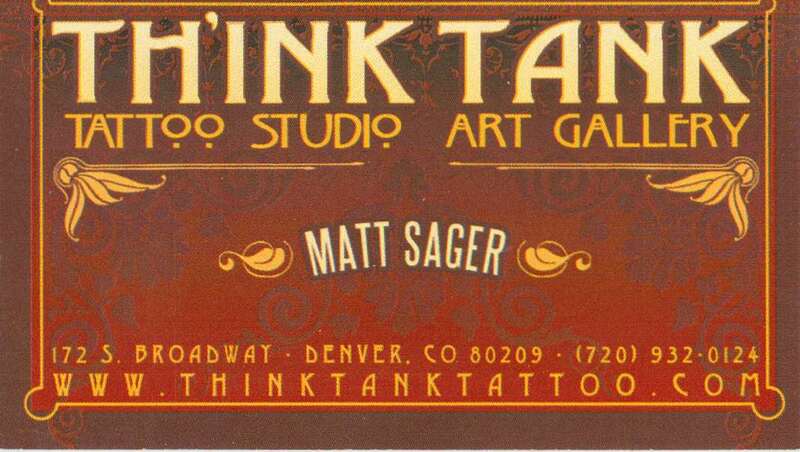 A friend was inked at the Th’ink Tank a year or so ago and recommended it, so I figured it was worth a look to see if I could find a good artist. It didn’t take much, since all of their artists, at least in my opinion, are very talented. So it’s more a matter of finding someone who made me comfortable. And that took no longer than my first introduction. 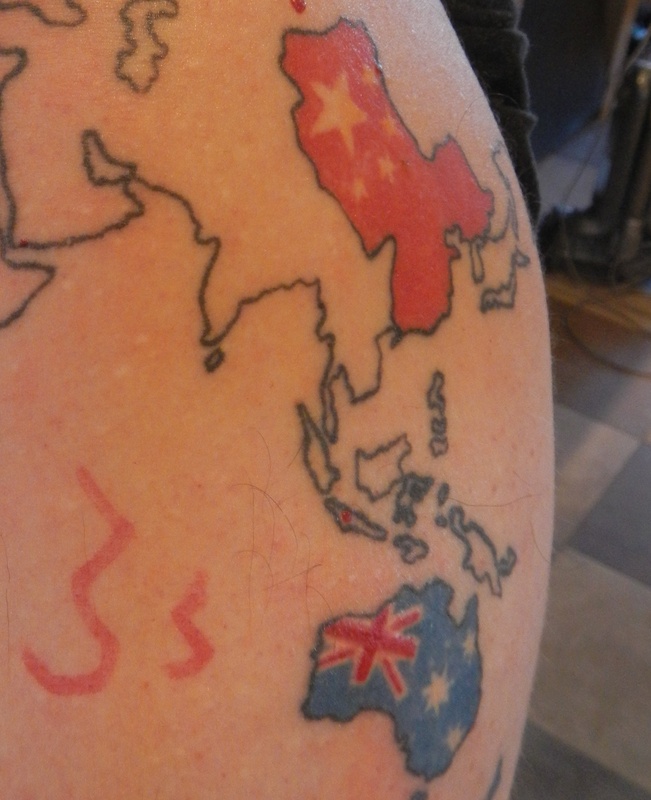 Matt Sager looked at my previous ink, the shapes of the countries and how he’d need to build off the previous artist’s work, and simply said it wasn’t a problem. He could do it. At first I was doubtful, concerned since no one I previously checked with said they could do what I wanted. But Matt seemed unconcerned, he’d do it in about an hour, and he’d even open the shop early for me so I could get it done before going to work for the night. I set the appointment, waited anxiously for over a week, and then arrived right on time. And as soon as I saw Matt again, my nerves faded and I knew he was the right one to update my tattoo. 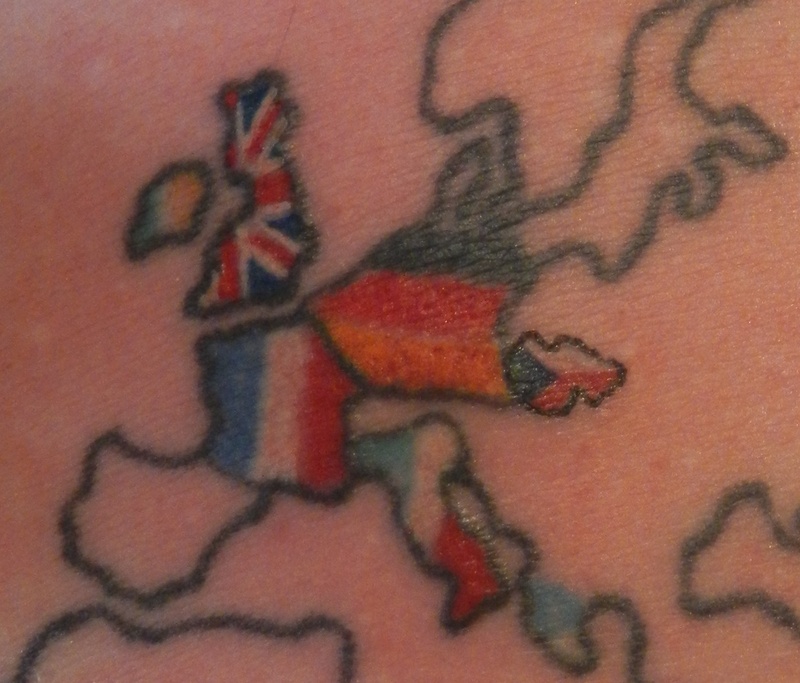 The end result exceeded my expectations since he was able to fit the British flag in such a small area that was previously outlined by the original artist who inked me in Vegas. He was also able to work with some of the mistakes she made, filling in some faded colors in Australia. Thankfully Matt is doing that for me once again, since some of what was done before needs some touching up only three years later; the colors are faded in some places and wearing completely off in others. Lesson? Don’t get a tattoo in Las Vegas. Check around with the tattoo shops in your area, since the artists are likely more talented and appreciative of your business, thus giving your PERMANENT tattoo the care and attention it deserves. So, while I was happy with the initial job which was done in Las Vegas, just as I am with Matt’s work in Denver, I have a better feeling about this one. Why? Because Matt lives here. He’s a member of the community. He knows I can stop in any time if there’s a problem, so he’s going to do the best job he can, which he did, thus making me a very happy tattoo patron in the process. In return, I’ll bring my business back to him and the Th’ink Tank again and again as I travel to more and more places – as well as recommend them to friends – and hopefully in a more timely fashion than the three countries I did for this update: England, the Czech Republic, and Rwanda. You’re tattoo is wrong. Germany is covering Belgium, Luxembourg and The Netherlands. Unfortunately it needed to be that way, since the BeNeLux countries are too small to ink.